Every Spring, we get ready for spaghetti! 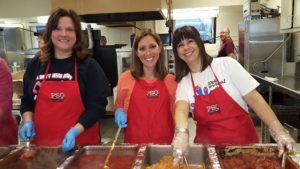 Established in 1954, Paris School’s Spaghetti Supper Fundraising Event remains a hit through the generations! Every March, Paris School serves up a delicious all-you-care-to-eat spaghetti dinner and homemade desserts followed by fundraising festivities in our gym. This longstanding event attracts more than 1,000 guests for an evening of food and fun with family, friends, and neighbors! A collaborative effort between the Paris School Organization and the Paris School Foundation, our Spaghetti Supper is an evening to behold! Our Paris School families, students, teachers, and staff work together to sell tickets, create amazing classroom raffle baskets, make kitchen preparations, and work volunteer shifts on event night. Our “Noodle Crew” arrives early on event day to begin pasta preparations and our middle school students clear tables and serve our guests throughout the evening. All-you-care-to-eat spaghetti dinner featuring sauce by Valeo’s Pizza! Dessert auction including candied bacon! Our delicious evening culminates with plenty of bidding and raffle action in our gym. Unique live auction offerings, dozens of silent auction items, themed classroom raffle baskets, and a multitude of delectable desserts ensure that buyers at every level can support our school and take something home, too! We thank our entire community for making this event the highlight of Spring in Paris for more than six decades! Click here to see a sample Live Auction Preview page including Spaghetti Supper dinner and event sponsors.